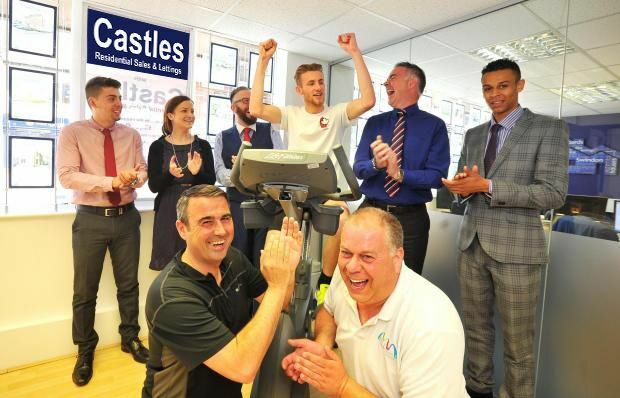 Castles Residential Sales & Lettings, one of Swindon’s leading independent estate agents, will host a static 12-hour cycling challenge at its Commercial Road office on Tuesday 30 June. Starting at 8:00 am, the ride will raise money for The Salvation Army and support local GB triathlete, Kev Tonner at the 2015 Geneva ETU Triathlon European Championships. Kev Tonner and top cycle time trialist and cycling consultant to Etape Suisse, Nick Lowe, will be participating in the challenge. They’ll be joined by business women, Sara Tye, Mark Puffett, managing director of MLL Print, Dom Machell, group leader and independent distributor for Telecom Plus PLCover, and Jeremy Morcumb, owner of Mortgage Advice Bureau Swindon. Looking ahead to the charity event, Mark Noble, founder and managing director of Castles Residential Sales & Lettings, said: “We’re thrilled to be hosting this static bike ride at our office. The Salvation Army transforms the lives of thousands here in Swindon, across the UK and throughout the world. It’s also great to do our bit for our local athletes. Kev Tonner is an incredible triathlete who trains and competes at the highest level. We’re also delighted that many of Swindon’s top business people will be involved in what will be a fantastic day. The Salvation Army demonstrates Christian principles through practical support. It offers unconditional friendship and practical help to people of all ages, backgrounds and needs. A sports therapist with Championship football club, Reading, Tonner also runs the successful Swindon Injury Clinic from Run, Wood Street, Swindon. He has been training for the 2015 Geneva ETU Triathlon European Championships since qualifying in June 2104 at the Rother Valley Country Park triathlon in Sheffield. Castles Residential Sales & Lettings is ranked 120 out of 14,107 UK estate agents on www.allagents.co.uk, as of Tuesday 23rd June 2015. It was exclusively handpicked by Cartus, the world’s premier provider of relocation services as Swindon’s only relocation agent, as well as being selected for memberships with The Guild of Professional Estate Agents and The Relocation Agent Network.